This entry was posted in Uncategorized on March 10, 2019 by Mike. It is going to be a GREAT day in the mountains, playing in the snow today. It is blue sky and sunny, temp is cold about 25 degrees and all road from the east side (I15) are open and clear with no tire chains needed. So get the kids and jump in the car and head up to the Mountains. This entry was posted in Uncategorized on March 9, 2019 by Mike. Looks like we should have a GREAT weekend for snow play we received about 2″ of snow in the past day and about 5″ of snow in the past week. So there is lots of new snow snow to play in. All roads coming in from the east from I15 are open with no tire chains requirements. So this might be a good weekend to come enjoy the snow with your family. Stop by Mountain Hardware 1390 Hwy #2 Wrightwood, Ca. 92397 and we will be able to give you the most current info on where to go and help you with any of your questions. 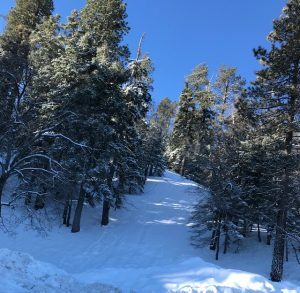 A couple of important points when coming up to the Wrightwood/ Big Pines area. Once you leave the I15 do not follow you apps on your navigation system. Take 138 west to Hwy 2 (at the stop signal and then take hwy 2 west to Wrightwood. This is the easiest and most direct route. Also make sure you stop by for a map so you can access the snow play areas so you can have fun and not be in someone’s yard. Also please pick up and trash from your day in the snow and you can drop it at Mountain Hardware until we close at 5pm or of course take it home please. This will make it nicer for the next visitor. I will post again early tomorrow morning for updated info. This entry was posted in Uncategorized on March 8, 2019 by Mike. Today is a beautiful day. Blue sky, temp. in the low thirty’s and there is still snow for snow play. Also all roads are open with NO tire chain controls coming in from the I15 on the east side. There should not be a lot of traffic today so come on up and have a great day in the Mountains with you family. If you have questions just stop by Mountain Hardware and we will help answer your questions. Please make sure you purchase and Adventure Pass as you will need this in any of the public snow play areas. Also please take minute and pick up any trash from your visit. If you stop and see us we will be happy to give you a trash bag for this purpose. Also on you way home to night just stop by the store and we will be happy to take the bag of trash from you so you do not have to take it home. This entry was posted in Uncategorized on March 3, 2019 by Mike. I would suggest that you just sleep in this morning. As we are getting rain in all the snow play areas this morning and is to continue all day. I just returned from up on the mountain and it is windy, rainy and the road has lots of rocks even thought Caltrans is pushing them off. So again my suggest not to come up today as it is kinda of a drippy day. This entry was posted in Uncategorized on March 2, 2019 by Mike. Please check with my posting before you travel up tomorrow. The weather service is call from rain in the morning. I do not think there will be much traffic so wait for my post before you decide to come on up. This entry was posted in Uncategorized on March 1, 2019 by Mike. It is a beautiful day. I just came back and there still are good areas to play in the snow. All roads are open and clear to come in from the east side the I15, 138, 2 way. Today would be the day to come and play as the weather service is calling for rain tomorrow. Make sure you stop by Mountain Hardware pick up a free map and to purchase a adventure pass you will need in most areas for parking. Lots of snow, roads are open no chains required. The only problem today will be the large amount of people coming up to play in the snow. I suggest to come early, be in town by 8-8:30 am at the latest and then plan on leaving the mountain by 2 pm. By doing this you should miss most of the traffic problems. Come on up, stop by Mountain Hardware 1390 hwy 2 Wrighwood Ca. 92397. We have the adventure pass you will need also a free snow play map just ask. This way you will know where it is safe and proper to play in the snow. This entry was posted in Uncategorized on February 24, 2019 by Mike. It is a beautiful morning is the mountains. We gave received abut 24″ of new snow in the last week. The conditions are GREAT. The roads are open and clean with NO tire chain controls to Big PInes. But all roads west of Big Pines are requiring tire chain as of this morning. This weekend will be very busy here. So I suggest that you plan to arrive early before the ski area traffic causes grid lock when they max out their parking lots. I would arrive in town by about 8-8:30 am at the latest. Then if you leave the area before about 2pm you will miss most of the afternoon traffic. Mountain Hardware 1390 Hwy @ Wrightwood, Ca 92397 will be open at 7am so please stop my and say hello. We also have the Adventure Pass for sale $5.00 per car you will need this pass in the snow play areas. Also we will have the most current road and snow conditions and we also have a FREE snow play maps. This entry was posted in Uncategorized on February 22, 2019 by Mike. We received about 2″ of snow in the snow play areas overnight. All Roads in the Wrighwood area are requiring Tire Chain this morning. It is about 21 degrees this morning and is to be cold all day with snow thru midnight. So I would think that the chain control will remain on all day. There is plenty of snow so if you are not geared up for winter travel just wait a few days and the roads will be clear and then you can come an enjoy the Mountains and all the snow we have this season. This entry was posted in Uncategorized on February 21, 2019 by Mike.